Tsuyoshi Wada (left), Blake Parker (center), and Arismendy Alcantara were all named to the 2014 All-PCL Team on Monday. 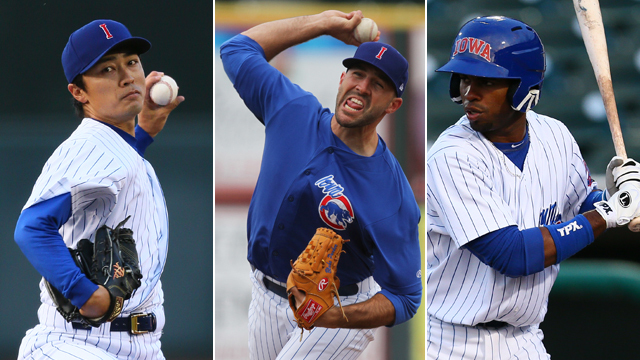 Des Moines, IA - Three Iowa Cubs were named to the 2014 All-PCL team today, as announced by the Pacific Coast League Office. 2B Arismendy Alcantara, LHP Tsuyoshi Wada, and RHP Blake Parker were all recognized for outstanding seasons as voted by the league's managers and broadcasters. This is the first time that Cubs have had three players named to the PCL's Post-Season All-Star Team. Alcantara batted .307 (103-for-335) with 25 doubles, 11 triples, 10 home runs, 41 RBI, and 21 stolen bases in 89 games with Iowa before getting called up to Chicago on July 9. At the time of his promotion, he was leading the PCL in triples and extra-base hits (46). His 11 triples are still tops in the league. He was also tied for the league lead in runs scored (62) and ranked second in doubles and total bases (180). He was third in hits, fourth in steals, and eighth in slugging (.537). Alcantara played 70 games at second base, but also made six starts at shortstop and 11 in the outfield. In 41 games with Chicago, Alcantara is batting .228 (38-for-167) with eight doubles, four home runs, 14 RBI, and seven stolen bases. He is the third Cub to be named as the second baseman on the All-PCL team, joining Chad Meyers (2001) and Eric Patterson (2007). Wada was named as the top left-handed starter in the league this year. In 19 games, including 18 starts with Iowa, Wada was 10-6 with a 2.77 ERA (35ER/113.2IP). He allowed 104 hits, walked 28, and struck out 120. He was called up by Chicago for his Major League debut in game two of a double-header at Cincinnati on July 8 and brought back to Chicago on July 23 where he has remained in the big league rotation. At the time of his promotion, Wada led the PCL in strikeouts, was fourth in ERA, fifth in WHIP (1.16), and tied for sixth in innings pitched. Wada is currently listed as second in the league in ERA and tied for third in WHIP, but if the Cubs play all of their remaining games, he will be two innings short of qualifying for the final ERA title. In eight starts with Chicago, Wada is 4-1 with a 2.56 ERA (13ER/45.2IP). He has allowed 37 hits, walked 11, and struck out 41. The only other Cub to be named as the top left-handed starter on the all-PCL team was Rich Hill in 2006. Parker is 0-1 with a 1.91 ERA (7ER/33.0IP) and leads the PCL with 23 saves in 33 games with Iowa this year. He ranks fifth in the league with 30 games finished. Parker has been called up to Chicago five times during the year and is 1-1 with a 6.08 ERA (9ER/13.1IP) in 10 big league appearances. His 23 saves are second on Iowa's single-season list and he is the franchise's all-time leader with 64 career saves. RH Jermaine Van Buren is the only former I-Cub to be named the PCL's top reliever. He won the award in 2005 when he set Iowa's single-season saves record with 25.